Director Delmer Daves (The Red House) 50's technicolor western The Hanging Tree (1959) stars late-era screen legend Gary Cooper, in his final western, as Dr. Joseph Frail, who rides into the small gold rush community of Skull Creek, Montana, setting up shop on a hill overlooking the tented village. He enlists the help of a sluice robbeer named Rune (Ben Piazza, The Candy Snatchers) whom he rescues from an angry mob, he having been shot by prospector Frenchy (Karl Malden, Cat O' Nine Tails) while attempting to steal a nugget of gold from one of the sluices at the camp. The doc more or less blackmails him into being his indentured servant, lest he turn in the would-be thief to the locals, who didn't get a good look at the culprit, and they would surely hang him from the local hanging tree for his treachery. Dr. Frail is not too well liked by the locals himself, earning the ire of a local faith healer named Dr. Grubb, played by George C. Scott (The Changeling) in his first ever on-screen role, it's a small but venomous role. Later when Swedish immigrant named Elizabeth (Maria Schell, Jess Franco's 99 Women) is found near the site of a stage coach robbery, the sole survivor, she is dehydrated and suffering from exposure, she's temporarily stricken blind and the doc takes her in and nurses her back to health. Down in the mining camp unsavory rumors begin to swirl about the doc and the woman, also spurring more gossip about the doc's dark past, including an incident involving his wife and brother going up in flames, casting aspersions on the doc's moral compass. Sure enough Gary Cooper plays the doc as a bit of a aging gambler and gunslinger, handy with a stethoscope and a six-shooter, and a guy not prone to taking guff from anyone, his rough and tumble demeanor and his earlier blackmailing of the criminal Rune feed into the character' supposed moral ambiguity. Cooper is great in the role, coming off as a decent man with a dark past, even rebuffing the love-interest of Schnell's character, who is so irritated by his seeming disinterest in her that she forms a business alliance with Rune and the overly-lusty Frenchy out if spite, the trio's team-up pays off with a sweet glory hole of gold found beneath the roots of a fallen tree, leading up to a raucous finale, as the drunken villagers look to hang the doc for murder. 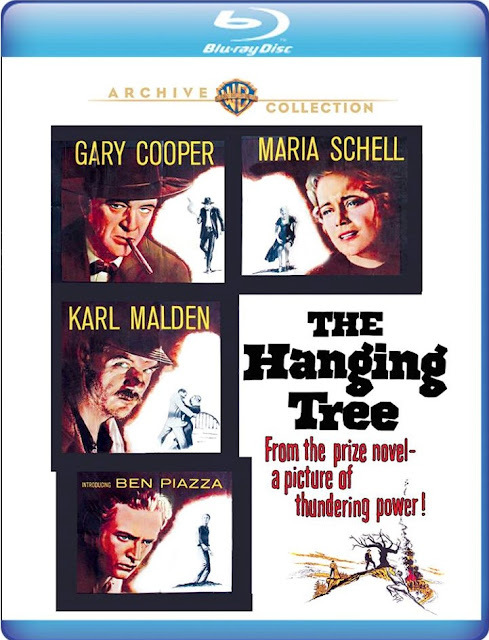 The Hanging Tree is nice slice of big sky western-Americana, the cinematography is great, capturing the mountainous wooded vistas, and the cast is top-notch, from Cooper's morally ambiguous doc Grail to Schnell's vulnerable but driven Elizabeth, add to that Karl Malden as a lecherous gold miner and George C. Scott as a venomous preacher and you have a nicely layered western I am pleased to have finally watched, this was a nice discovery for me. Audio/Video: The Hanging Tree (1959) arrives on Blu-ray from the WAC with a new 2018 remaster from a 4K scan of the original camera negative, and it looks great, lensed by cinematographer Ted McCord (The Sound of Music, The Treasure of the Sierra Madre) this has wonderful outdoor photography of the rural, wooded hillside community of Skull Creek, a lot of it captured from numerous crane shots offering treetops and big sky sights that translate well to HD with nice, crisp detail and vivid imagery. The lone audio option is an English DTS HD-Master Audio 2.0 with optional English subtitles, the winner here is the dramatic western score from Max Steiner (Gone with the Wind), a clean and well-balanced track, the Marty Robbins crooned theme song is also corny fun. The only extra on the disc is a theatrical trailer for the movie. While I do tend to steer towards the more violent and stylish Italian spaghetti westerns when left to my own devices, which are more my speed, I must say that Warner Archive have been opening my eyes to some very cool American revisionist westerns of the 50's and 60's , this is right up there with Ride the High Country (1962), a welcome addition to by western library and a wonderful presentation from the WAC.